Cholera has smoldered in an endemic fashion on the Indian subcontinent for centuries. There are references to deaths due to dehydrating diarrhea dating back to Hippocrates and Sanskrit writings. Epidemic cholera was described in 1563 by Garcia del Huerto, a Portuguese physician at Goa, India. The mode of transmission of cholera by water was proven in 1849 by John Snow, a London physician. In 1883, Robert Koch successfully isolated the cholera vibrio from the intestinal discharges of cholera patients and proved conclusively that it was the agent of the disease. The first long-distance spread of cholera to Europe and the Americas began in 1817, such that by the early 20th century, six waves of cholera had spread across the world in devastating epidemic fashion. Since then, until the 1960s, the disease contracted, remaining present only in southern Asia. 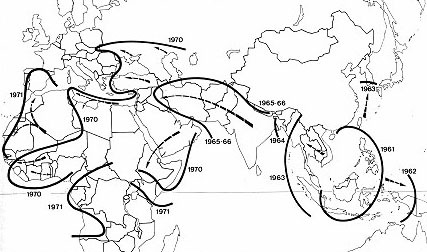 In 1961, the "El Tor" biotype (distinguished from classic biotypes by the production of hemolysins) reemerged and produced a major epidemic in the Philippines to initiate a seventh global pandemic (See map below). Since then, this biotype has spread across Asia, the Middle East, Africa, and parts of Europe. There are several characteristics of the El Tor strain that confer upon it a high degree of "epidemic virulence" allowing it to spread across the world as previous strains have done. First, the ratio of cases to carriers is much less than in cholera due to classic biotypes (1: 30-100 for El Tor vs. 1: 2 - 4 for "classic" biotypes). Second, the duration of carriage after infection is longer for the El Tor strain than the classic strains. Third, the El Tor strain survives for longer periods in the extraintestinal environment. Between 1969 and 1974, El Tor replaced the classic strains in the heartland of endemic cholera, the Ganges River Delta of India. El Tor broke out explosively in Peru in 1991 (after an absence of cholera there for 100 years), and spread rapidly in Central and South America, with recurrent epidemics in 1992 and 1993. From the onset of the epidemic in January 1991 through September 1, 1994, a total of 1,041,422 cases and 9,642 deaths (overall case-fatality rate: 0.9%) were reported from countries in the Western Hemisphere to the Pan American Health Organization. In 1993, the numbers of reported cases and deaths were 204,543 and 2362, respectively. In 1982, in Bangladesh, a classic biotype resurfaced with a new capacity to produce more severe illness, and it rapidly replaced the El Tor strain which was thought to be well-entrenched. This classic strain has not yet produced a major outbreak in any other country. In December, 1992, a large epidemic of cholera began in Bangladesh, and large numbers of people have been involved. The organism has been characterized as V. cholerae O139 "Bengal". It is derived genetically from the El Tor pandemic strain but it has changed its antigenic structure such that there is no existing immunity and all ages, even in endemic areas, are susceptible. The epidemic has continued to spread. and V. choleraeO139 has affected at least 11 countries in southern Asia. Specific totals for numbers of V. cholerae O139 cases are unknown because affected countries do not report infections caused by O1 and O139 separately. In April 1997, a cholera outbreak occurred among 90,000 Rwandan refugees residing in temporary camps in the Democratic Republic of Congo. During the first 22 days of the outbreak, 1521 deaths were recorded, most of which occurred outside of health-care facilities. In the United States, cholera was prevalent in the 1800s but has been virtually eliminated by modern sewage and water treatment systems. However, as a result of improved transportation, more persons from the United States travel to parts of Latin America, Africa, or Asia where epidemic cholera is occurring. U.S. travelers to areas with epidemic cholera may be exposed to the bacterium. In addition, travelers may bring contaminated seafood back to the United States. A few foodborne outbreaks have been caused by contaminated seafood brought into this country by travelers. Greater than 90 percent of the cases of cholera in the U.S. have been associated with foreign travel. V. choleraemay also live in the environment in brackish rivers and coastal waters. Shellfish eaten raw have been a source of cholera, and a few persons in the United States have contracted cholera after eating raw or undercooked shellfish from the Gulf of Mexico. Antigenic variation plays an important role in the epidemiology and virulence of cholera. The emergence of the Bengal strain, mentioned above, is an example. The flagellar antigens of V. cholerae are shared with many water vibrios and therefore are of no use in distinguishing strains causing epidemic cholera. O antigens, however, do distinguish strains of V. cholerae into 139 known serotypes. Almost all of these strains of V. cholerae are nonvirulent. Until the emergence of the Bengal strain (which is "non-O1") a single serotype, designated O1, has been responsible for epidemic cholera. However, there are three distinct O1 biotypes, named Ogawa, Inaba and Hikojima, and each biotype may display the "classical" or El Tor phenotype. The Bengal strain (O139) is a new serological strain with a unique O-antigen which partly explains the lack of residual immunity. Endotoxin is present in Vibrio cholerae as in other Gram-negative bacteria. Fewer details of the chemical structure of Vibrio cholerae LPS are known than in the case of E. coli and Salmonella, but some unique properties have been described. Most importantly, variations in LPS occur in vivo and in vitro, which may be correlated with reversion in nature of nonepidemic strains to classic epidemic strains and vice versa.